It’s no surprise that new Magic Milk is now winning friends all around the world and riders are finding that it beats the old established brands in every way. 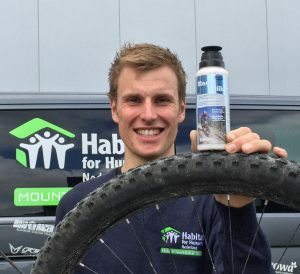 And now, OKO Magic Milk has been tested competitively and found to be the ‘perfect’ solution by Habitat for Humanity, the leading XCO/XCM World Cup mens and womens racing team. Based in the Netherlands, they race all around Europe and worldwide. They continue to use Stan’s No-Tubes wheels with their Kenda tubeless-ready tyres, but will now rely on Magic Milk tubeless tyre sealant to stay puncture free in their races. They find that OKO’s sealant is by far the best for their set-up. As a result, OKO has become a sponsor of the Habitat Mountainbike Team for 2015/2016, and the company is proud to add its latex-free milk technology to the team’s impressive arsenal of cutting-edge bike products. Make this the season that you too switch to the future of tubeless tyre sealant, now available in larger 500ml and 1 litre sizes for even better value: OKO Magic Milk.